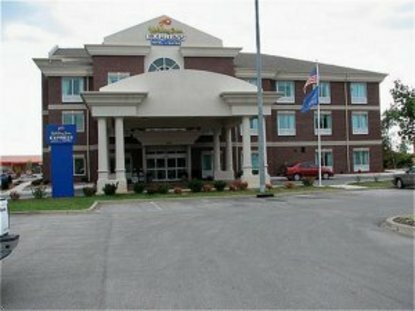 The Holiday Inn Express Hotel & Suites is Frankfort, Kentucky's finest hotel. The Holiday Inn Express Hotel & Suites has 67 rooms, including 3 jacuzzi suites, indoor-heated swimming pool, 24-hour guest laundry, fitness center, business center and a lavish 1350 sq. ft. meeting room. The hotel is located just minutes from the historic Kentucky State Capitol, Governer's Mansion, and Kentucky State University. Guest enjoy Historic Downtown Frankfort, World Famous Rebecca Ruth Bourbon Candy Factory as well as the Kentucky Bourbon Trail including Woodford Reserve, Buffalo Trace, Makers Mark, Wild Turkey, Jim Beam, and Four Roses Distilleries. Situated between Louisville International Airport and Bluegrass Airport in Lexington right off I-64 exit 53 B, The Holiday Inn Express Hotel & Suites is Frankfort, Kentucky's newest option for lodging. This hotel is committed to providing accessible facilities under the American Disabilities Act. If your accessibility needs are not met, please contact the Hotel Manager on Duty. Should you require additional information regarding accessible facilities for guests with disabilities, please call 1-800-Holiday (U.S. and Canada) or contact the hotel directly. For the hearing impaired, TDD service is available at 1-800-238-5544 within the U.S. and Canada.